Revenue Cycle Management (RCM) is an integral process in today’s healthcare environment. Improving each cycle point with Ascent solutions and services is a leading strategy to sustain financial health and stability across your enterprise. Our comprehensive RCM services are designed to meet the specific requirements of our healthcare clients. Ascent’s unique 5-Track Transition Methodology, coupled with years of successful process transition experience and deep domain expertise ensures client satisfaction and significant year-on-year rigorous productivity improvements. Our shared goal with healthcare providers is to improve clinical, financial and human performance, which yields consistent and long-term success in the ongoing mission to better serve their community. We recognize that each organization has its own set of strategic, operational and financial challenges, and we tailor our solutions and delivery to achieve the potential of your provider enterprise. Billing Operations Review – Assess the billing and accounts receivable process, staffing, and workflow. Collection Performance Assessment – Calculate the appropriate ratios to assess the performance in comparison to other enterprises providing similar services at similar size. Technology – Assess the existing technology investments and determine if they are being optimally utilized. Coding – Assess medical services and proper CPT code assignments. Documentation Compliance – Review the medical record documentation to determine sufficiency in meeting government payer requirements for E&M CPT codes charged (including compliance review, education and documentation templates for easier compliance). Overhead Analysis – Compare overhead, by category, to national norms. Ascent offers a wide-range of HIM services to hospitals and large physician groups nationwide. Services include Professional Fee Coding, Facility Coding and Coding Audits. Our robust team of HIM professionals is ready to support healthcare facilities of all sizes – large, medium and small. The HIM industry is constantly evolving, which makes it challenging for healthcare providers to stay current with industry changes. Ascent is committed to educating and updating our clients on a continuous basis; and we’re also dedicated to keeping our staff current on all evolving compliance requirements. Ascent’s team of auditors works closely with each client to create a customized solution ensuring that our clients’ unique needs are being met. Many medical facilities are starting to use Ascent’s Patient Engagement services to collect more money faster and earlier in the revenue cycle process this allows providers to avoid sending patient accounts to collections, which helps maintain steady patronage and fosters good public relations. With higher deductibles, earlier payments ensure self-pay cash flow and higher percentage self-pay account resolution. Ascent refers to Early-Out Services as a “soft collect.” Early-Out is an extension of billing activities whereby the accounts are not actually in collections. In our experience, patients will delay making payment arrangements because they don’t understand the many intricacies of health insurance. Ascent’s Early-Out staff consists of trained billing professionals capable of “walking” patients through the complexities of a wide range of health insurance plans. Understand the care payment status (deductibles, balance owed, percentage splits, denied claims, etc.). Decide how best to pay the bill, whether (in full, by check, credit card, payment installments that are closely tracked, etc.). Payments can also be mailed, called in or even made on Ascent’s web site. Quickly identify patients’ qualification for state assistance or charity programs. Obtain pre-authorizations within the time limits allowed. Obtain correct insurance information or identify payment options, if insurance provided to the facility is denied. Avoid having their accounts turned over to collections agencies for possible credit violations. Initial Statement can be generated by your facility or by ASCENT. Accounts can be uploaded to ASCENT at this time or 30 days later, depending on your facility’s needs. Upto 30 days-payments can be sent and handled by your facility or sent and handled by ASCENT. Phone calls can commence or placed on hold until after the first EO letter is generated by ASCENT. A dedicated Local dial/ 1-800 phone number is created and dedicated to your facility. Dedicated staff members answer the phone professionally as your facility. Addresses are verified by ASCENT mail service and corrected if necessary prior to first mailing. 30 to 60 days-First EO letter is sent. Phone calls are limited to twice a week and a Predictive Dialer, with custom messages that adhere to the HIPAA statutes, are generated. Busy signals and no answers are eliminated and collectors spend 400% more time talking to patients. 60 to 90 days-Second EO letter is sent. Phone calls continue. Place of Employment phone numbers can be added. 90 to 120 day- Last EO letter is sent, informing the patient that the next step is to send them to collections and possible report to credit. Phone calls to home and place of employment are continued. Campaigns can be run to offer discounts for a period of time to boost return at crucial financial times for the facility. High Balances have a credit report run and an asset search is done to aid the patient in payment options. Notes are uploaded from ASCENT system to your facility for real time information on accounts. Adjustments and Posting of payments can be posted in your facilities system by the staff at ASCENT. Reports are sent monthly or can be customized by information needed and frequency required by your facility. Aging buckets in self-pay and patient responsibility will show significant improvement, along with your facilities cash flow. Ascent’s Consulting Services combine deep healthcare domain knowledge, process expertise and cutting-edge technology skills to help provider organizations address their most critical business and technology challenges. Ascent focuses on providing a wide range of technology consulting services including Product Management, Regulatory & Product Compliance, MSO/ACO Formations, Customized Application Development, Patient Engagement Solutions, Big Data and BI (Business Intelligence)/Analytics. The proper application of one or more of these services helps clients enhance their technology solutions and their clinical data assets. Ascent’s consulting approach includes well-established methodologies and Best Practices to efficiently evaluate your issues of concern and provide accurate responses. With experienced professionals from diverse areas of healthcare, technology and consulting, we bring deep industry knowledge and insight to the unique business needs of our clients. Quality documentation and timely completion of patient charts are vital to providing high-quality patient care along with a steady cash flow for healthcare organizations. Regardless of the care setting, busy work schedules often lead to physicians lagging behind in the completion of patient charts with the necessary quality of documentation. Ascent launched this specialized EMRScribe service in an effort to support the specific needs of physicians and administrators alike. Physicians can directly upload their digital audio dictations or use our cloud dictation service to capture their detailed notes. 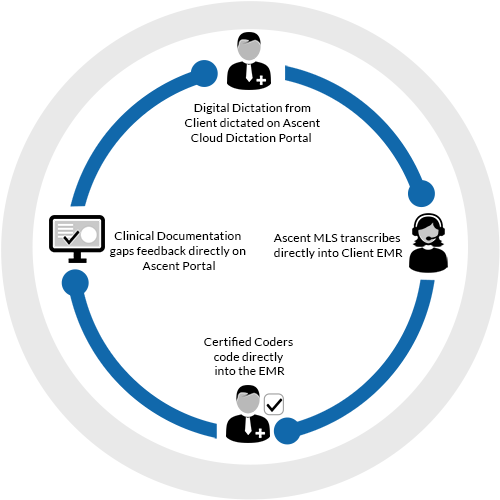 Ascent’s skilled Medical Language Specialists will then transcribe directly into the patient chart in your EMR. Certified Coders will code the documents directly into the EMR and also identify any gaps in clinical documentation. Our Certified Coders and Medical Language Specialists service clients in over 50 medical specialties. In fact, Ascent is one of the largest providers of Transcription Services to hospitals, surgery centers, clinics and physician offices. Achieve reporting compliance via MU/ Quality programs. Reduce billing cycle and improve collections. Improve patient safety and satisfaction. Eliminate the headaches of physician data entry. Better manage your time to treat patients and schedule more procedures. Ascent is a leading national provider of revenue cycle management services to Dental Practices. Progressive practices are partnering with Ascent to increase the productivity and profitability of their practice while improving the quality of the patient’s experience. Our experts combine industry best practices and innovative tools and methodologies to help improve patient satisfaction, reduce operational costs while streamlining processes through continuous improvements and technology optimization. Payment Posting / Adjudication, Adjustments & Denial Processing. Collaborative approach that evaluates your business processes and implements workflow improvements. Policies and procedures that ensure fair and dignified collection for all patients. Complete and smooth transition,quick ramp-up to full productivity,positive impact to cash flow,and timely billing of all third-party accounts. Resolution of denials and delays in third party payment processing, ensuring the best A/R metrics possible. State-of-the-art credit analysis, advice on patient paymentagreements, and the best outcomes for self-pay collections. Good account receivable management requires more focus. We discover and help correct inefficiencies in office practices that lead to denied claims and lost revenue–eliminating most delays before the claim is sent. You will be More Organized :Are your EOBs organized ? How often are they referenced? Without knowing why a claim was denied, it’s impossible to correct it or explain it to a patient. Our service will organize your EOBS into searchable PDF documents stored on your network. Ascent has been providing high quality transcription services to Hospitals, Physician Groups and MTSO in the United States since 1999. We currently process over one million lines per month and have a staff of over 150 Transcriptionists and Editors, each with an average of three years of experience. We consistently deliver 98.5% accuracy as prescribed by AAMT. Ascent offers TAT to meet Client requirements. We currently provide TATs ranging from 4 hours to 24 hours. Ascent follows the AAMT guidelines of 65 characters (including blanks) for pricing calculation. Ascent has the necessary technical set-up to accept voice files in any format on our secure 128 bit SSL encrypted FTP. Alternately, Ascent can provide a Dictaphone System/ Toll-Free dialing facility if the Client so desires. Operative Reports in GI, Cardio, etc. Ascent follows AAMT standards to ensure high quality transcription work to healthcare organizations. We have a comprehensive quality policy in place, and no files or data leave the server until all accuracy standards are met. The QC process involves ensuring that accuracy levels are built-up as the transcription work progresses. Medical Transcriptionists are divided into Teams, each headed by a Senior MT, also known as a Team Leader. 100% of the transcribed reports are proof-read and edited to attain the necessary accuracy level of 98% to 100%. If doubts and/or blanks still exist, the files are sent to QC to fill up the blanks and ensure the document is of high quality. We also have a Quality Audit team which randomly selects edited files and performs checks to ensure that quality standards are consistently being met. About 20% of the work done on a daily basis is randomly audited. Finally, Ascent has a highly focused Recruitment Program that vets and accepts only those candidates that meet or exceed the rigid professional employment parameters as defined by the Company. Ascent takes great pride in handling sensitive client and patient information with the highest level of care, diligence and confidentiality. We are forever cognizant of the faith and trust placed in us by our provider clients to ensure HIPAA compliance at all times. The security of information, person and property – including PHI, Data, Network, Hardware, Software and Physical Infrastructure – remains an unwavering corporate commitment. At Ascent, we have created a unique framework of innovation and healthcare industry expertise. Our technology solutions are a product of extensive research and execution experience in the healthcare industry. Ascent understands that the technology needs, infrastructure and proficiency of each client is different. Whether you are a hospital, physician practice or a third-party billing service, we combine our healthcare industry expertise with Best-of-Breed technologies to enhance interoperability, scalability and adaptability with your existing infrastructure investments. We use the most effective combination of onshore and offshore resources to provide you with the best return on your investments. HL7 Integration and interfaces with diverse systems for enhanced interoperability.